The firm behind the fast-food outlets booked a big charge on its property portfolio. THE FIRM THAT operates the Kentucky Fried Chicken franchise across the island of Ireland recorded a loss of over €7 million last year. Nevertheless, the figure was down from the massive €45 million loss the company reported in 2015. Much of the plunge into the red may be explained by a group restructuring which saw the firm book a €10 million exceptional charge on the value of its investment properties. Last year the firm booked a much larger exceptional charge of almost €47 million after a property revaluation. According to new accounts filed for Herbel Restaurants (Ireland) Ltd, the company made an operating loss of €7.4 million in the year to the start of December 2016. This compared to an operating loss of €44.7 million the year before, when the firm took the investment hit. Herbel Restaurants is owned by Belfast-based property developer Michael Herbert and his wife Lesley. 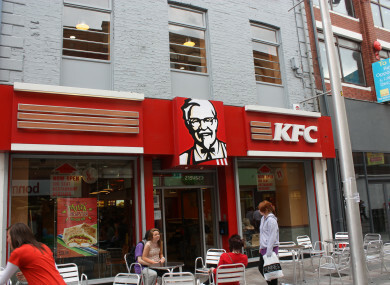 As well as owning the KFC franchise in both Northern Ireland and the Republic, the firm also has a large property portfolio. When everything was taken into account the company made a full-year loss of €11 million, compared to about €38 million in its 2015 financial year. A note in the director’s report said that during the period the company “and its fellow group companies refinanced their loans and restructured their businesses resulting in the company’s sale of certain investment properties to fellow group companies”. “The company continues to operate with the support of its remaining lender in order to finalise the restructure of group debt,” it said. Herbel’s turnover rose from just under €10 million to more than €13 million during the year. However, ‘cost of sales’ of €6 million and ‘administrative expenses’ of almost €15 million meant the firm also recorded an operating loss. The company’s net liabilities rose from just over €10 million to more than €21 million. The number of staff employed by the firm remained broadly the same year-on-year, rising slightly from 182 to 192. Staff costs rose from €2.2 million to €3.1 million. Email “KFC's Irish franchise racked up multimillion-euro losses last year”. Feedback on “KFC's Irish franchise racked up multimillion-euro losses last year”.